Dennis M. Lox, MD, presented his experience in the field of stem cell medicine with athletes, sports medicine, and osteoarthritis patients in The New Jersey meeting May 16-18, 2017. 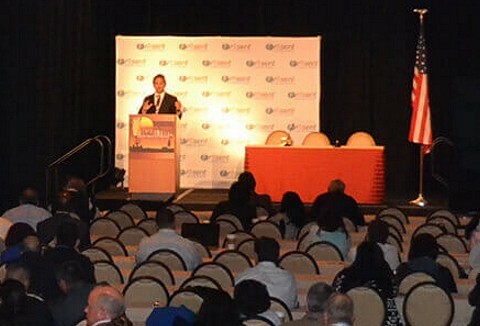 Keynote Speaker and internationally renown stem cell expert Dr. Anthony Atala also addressed the audience. He was featured on 60 minutes, spoke on his research in 3-D Bio-printing of human organs and other milestones in the field of stem cell medicine. Experts presented on various topics throughout the conference. The Andrews Orthopedic Institute was represented by Dr. Adam Antz and Dr. Lox, who maintains active practices in Florida and California. They both spoke on complex orthopedic and sports medicine cases. Dr. Lox discussed cases ranging from athletes obtaining college scholarships to the professional ranks in various sports. He has utilized stem cell therapy for the treatment of a variety of conditions from the foot, knee, hip, spine, elbow and neck and back pain. Dr. Lox has treated athletes from all types of sports including; ballerinas, soccer, baseball, football players up to the professional ranks. There is no simple method to address every patient. Instead, an individualized approach is needed to assess each patient to get the best results. Patients have traveled from other countries to see Dr. Lox and gather his insight into their condition, which has led to many different discussions from experts around the globe on various types of stem cell treatments. There are many different opinions and not total uniformity of thought on any subject matter. Dr. Lox has stayed abreast of the field of Regenerative Medicine and stem cell therapy, which translates to better care for his patients.